Normally I do not blog about current news per se, but this time, I'm on a mission. This morning, I opened my email to find one from noreply@picnik.com stating that Google (who acquired Picnik in 2010) will be closing the site this April. If you have ever used a photo editing software, you will agree that once you find that magic button pushing manipulator, it becomes your baby. Who can resist this unedited photo? I have been using Adobe Photoshop for many years now. I think I was first introduced to the software back in 1999 or 2000, during my set design years. I had no idea how to really use it properly, and it has taken constant use to really get the effects down pat. Once you get the ins and outs of Photoshop, it is like second nature. Until they come out with the next version... which has its own quirks to learn (just like any update to software). To check out Picnik, click here! http://www.picnik.com/ and click on "Get Started Now"
this photo is even more ethereal and memorable! Sounds more for photo nerds; who cares? If that's what it sounds like, or that's what you are thinking, you are SO WRONG! 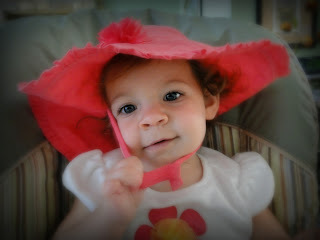 Picnik can be used by the most novice of digital photographers, but also by those of you who just like to tinker around. You can make your own holiday cards with themed borders, typing, stickers, and more! And then download your images in a variety of compression sizes... they are yours! Some sites hold your photos hostage... NOT PICNIK! Over the years, I have used this site to teach the novice adult digital photographers (via classes I teach) who can't afford (or even need) Photoshop. I have used the site to manipulate my own images quickly and creatively. 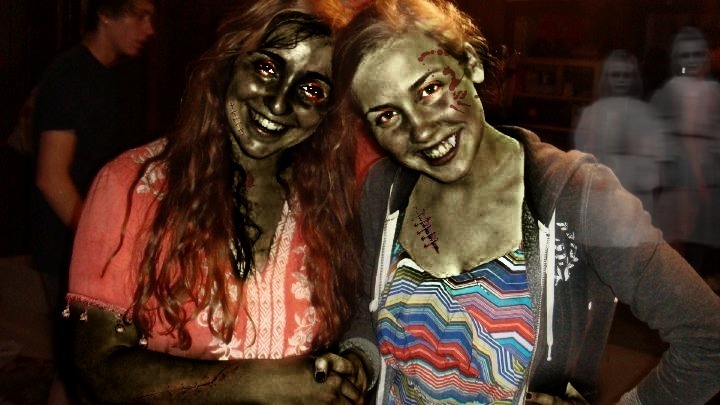 I have used the site to change my high school students into zombies during my after school photo club. I have quickly edited photos for weddings I've shot (in Photoshop, this might take up MONTHS of my weekends and evenings to adjust). You can see some of the Picnik filters I used in my wedding photography post, http://projectartaday.blogspot.com/2012/01/wedding-photographer-tough-gig.html. I've used the site to create cheesy photo holiday cards (though you could make not-so-cheesy cards, too). This site offers a plethora of photo editing opportunities, making this technology accessible to ANYONE, regardless of their abilities or cash-flow (as Photoshop can run upwards of $700 for the entire suite). What else is so great about Picnik? The team's sense of humor! Everything on the site has this quirky, funny voice to it that just puts you at ease to be working with it. Hence, this is why Picnik is so inviting and user friendly to even the most novice of user. You enter the site, and while the page is loading (let's pretend it's Halloween), the page shows the load bar and it will say above it, "eating eyeballs," "biting some necks" or something silly like that. Who doesn't love the ever approachable tabs that state, "Shiver me timbers: Embrace your inner scalawag," or "Thanksgiving: First give thanks, then pass the gravy." Come on, people! Can you tell how much I love Picnik? During Google’s earnings call Thursday, CEO Larry Page said that the company was doubling down on Android, YouTube, Gmail, Google + and other products central to its business. Ok Google. Let's see you fix the world! In the meantime, did you think that closing a site that allows MILLIONS of consumers to learn how to edit photos using today's technology was the best idea? Picnik is teaching people how to adjust and edit photos... something that many cannot afford to do on their own. Ok, so maybe using Picnik does not feed a starving child, or make a home for those on the streets. But, maybe it should! Regardless, being able to teach my students how to manipulate photos on this accessible, easy, inexpensive tool allows my students a foundation of today's technology; something they will need as they move into our evolving technological world, preparing them for college or career. This sounds maybe a bit silly, but this site (as I mentioned) can be as simple and cheesy as adding a mustache for Movemeber, and also as complex as learning how to use levels to adjust a photo. The good news after the bad. 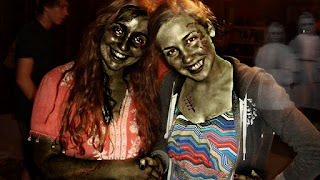 for our Halloween party- using Picnik. While anyone can use Picnik for free, you do have to pay a $24.95 annual fee to be able to use Picnik Premium (which is basically some more advanced, more exciting editing tools). This is a nominal fee for the entire year worth of premium features. Picnik is refunding ALL of this year's premium annual fee to all premium users. Apparently, it doesn't matter if you are in your last day of premium usage for the year, they will still refund the entire amount. Way to go, Picnik! Once again, you show to be a stand-up team! (Even if this move was made by Google, I still would like to attribute it to Picnik...) What is even more stand-up, is that Picnik will offer Premium Features to ANYONE for FREE from now until April when it is closed. But right now, I say, "GO AWAY GOOGLE AND SIT IN THE CORNER! You've made a BAD DECISION! I don't want to talk to you right now or see you (even though you are my search engine and you taunt me with your GOOGLE opening page every day). BOO TO YOU, GOOGLE!" Hopefully for my avid followers, I will stop being a pouting 14-year-old girl by the time I post next. Maybe. 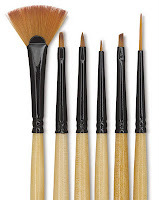 Here, I talk about the kinds of brushes I like to use. The funny thing is that I am so non-specific I feel horrible that I get to be featured on a site about brushes!! 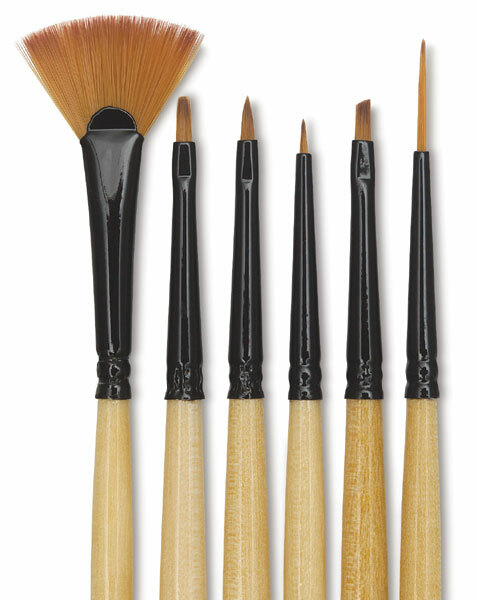 I work with so many different brushes that I don't usually notice the brand or type... it's all by touch and feel (and cost!) for me. I was just about to explain all of that, but heck! You can just read the article. The Dynasty Brush blog is written by a long time friend of mine who works for a few art companies as a blogger. For someone who blogs in a very informal manner (me), I was so honored to be asked to be part of, none-the-less featured in her very professional writing. I just HAD to boast, since... well, this time, it wasn't ME who was blogging about... well, ME! I had a conversation way-back-when about blogging and how self serving it is. How narcissistic to be writing about yourself and posting it to the world! I would just like to mention that similar form of writing... umm, the memoir? And, I justify my writing a tiny bit more because my posts here have some connection with art, as opposed to that very addictive form of social media: THE FACEBOOK (yes, I call it "the"- when my students ask me if I'm on FB, I reply, "What's that? A book of faces or something? "); wherein you find all sorts of meaningless, funny, annoying, inappropriate forms of communication via statuses and wall posts (all of which I am completely innocent...ahem). And at least none of my posts here are inappropriate. Right? Needless to say, this was a very exciting opportunity! Here's to keeping those fingers crossed to become even more widely known in that vast inter-web space. In the meantime, I wanted to give a shout out and kudos to my good friend, Karyn, and her artwork. Karyn is an artist, a mother, a wife, a carpenter, a painter, a scenic artist, a writer... what else? For the past 3 years, Karyn and her husband, Bill, have been working on renovating their 130 year-old victorian home. I might say that I am incredibly jealous... but then I read her blog about the immense amount of work that they have put into restoring the home and I say, so glad it's you and not me. Karyn always has had an eye for detail, and it's very apparent in the time she spent to hand stencil "wallpaper" in her entire dining room. After working with Karyn for years in the scenic (theatre) industry, I was quite taken aback by her most recent artwork. Karyn is a highly skilled realist painter, however, her abstract works have piqued my tactile senses. 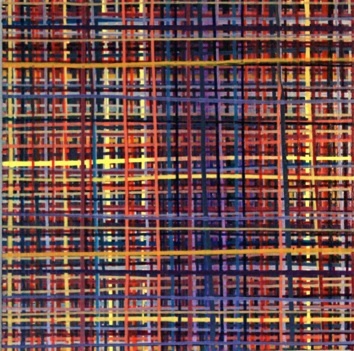 Karyn works with acrylics to create uniquely woven lines of paint on the canvas that from photos reminds me of wool loom work. I strongly believe that artwork should be available to touch, and Karyn's work makes me want to run my fingers across the canvas, rippling my finger tips gently along the dips and bumps created from the paint. 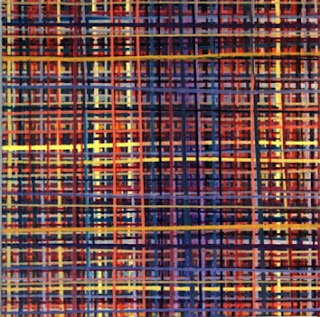 Layering is an aspect that I use throughout all of my artwork, and I just love how much depth Karyn gets with her multiple weaving layers of paint. Now, I must admit. I have not seen one of these paintings in person due to our unfortunate distance, so it is quite possible that the work has very little actual physical texture. To me, that makes her work even more luscious and tactile.